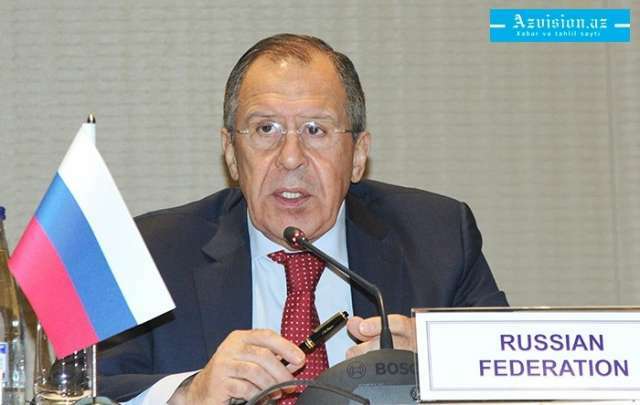 The main anti-terrorist task in Syria is routing the Jabhat al-Nusra terror group (outlawed in Russia), Russian Foreign Minister Sergey Lavrov said at a meeting with leader of Syria’s Tomorrow opposition movement Ahmad Jarba on Wednesday. It is clear that the main fight (against the Islamic State, IS, terror group, outlawed in Russia - TASS) is over. Now, of course, the main anti-terrorist objective is the defeat of Jabhat al-Nusra," the minister said, AzVision.az reports citing TASS. The Jabhat al-Nusra terror group has been receiving assistance from abroad to fight the Syrian army, according to Lavrov. "The Syrian army and its allies have been pushing al-Nusra members out of the country with our support," the Russian top diplomat said. "However, they are still resisting, in particular, as far as we know, because they have been receiving assistance from abroad," Lavrov stressed. Moscow is confident that the Syrian Congress of National Dialogue will help start a direct dialogue between the Syrian government and the opposition in Geneva, Lavrov said. "We are confident that, just like a year ago, the initiative to establish the Astana platform galvanized our UN counterparts, the Syrian Congress of National Dialogue will definitely help Special Envoy of the UN Secretary-General for Syria Staffan de Mistura and his counterparts to ultimately start a direct dialogue in Geneva without any preliminary conditions," Lavrov said. "This chiefly concerns constitutional issues and preparations for the election." Moscow is in favor of laying the most solid foundation for launching the constitutional reform in Syria, according to Lavrov. "Our goal is to lay the maximum substantial foundation for launching the constitutional reform, create the conditions, which must be agreed on by the Syrians themselves, and, in this sense, implement the provisions of UN Security Council Resolution 2254," Lavrov said.